CBeebies Land brings some of childrens television's most loved characters to life, including Mr Tumble, Igglepiggle, and Postman Pat. Just like CBeebies broadcasting style there is a whole range of activities for the Resort's youngest guests to take part in, with plenty of educational attractions as well as rides and shows. Passing by the CBeebies Photo Studio, you soon arrive at the CBeebies Clock Tower, where you have a choice of which direction to take. One path takes you through the heart of Greendale as you pass by Postman Pat's Parcel Express, where a familiar fleet of vans are busy delivering all manner of packages. Alternatively you might want to visit the Big Fun Showtime arena, where the Zingzillas and a host of other characters wait to meet you. A little further along this same path you'll pass the Furchester Hotel and Go Jetters Vroomster Zoom Ride before entering Treetopolis, home to the Tree Fu Tom Training Camp. The Numtums' Number-Go-Round sits at the hub of CBeebies Land, with various rides and attractions surrounding it. From here you can choose whether or not you want to visit Justin's House and have a go with in his Pie-O-Matic Factory, or perhaps you'd prefer to pay a visit to Charlie and Lola and see their Moonsquirters and Greendrops. Beyond the central hub of CBeebies Land, you can find the entrance to one of the area's signature attractions and climb aboard the In the Night Garden Magical Boat Ride. Or perhaps the Tiddlers would prefer to visit Mr Bloom's Allotment, which can be found towards the back of CBeebies Land next to the area's latest attraction, Peter Rabbit Hippity Hop. The area first opened in 1989 as the Britannia Building Society Farm, a primarily educational area guests could see cows being milked and an exhibition on modern farming (Farm-a-Rama). Guests could also take a leisurely boat ride around the farms paddocks to see the various animals in residence and a pottery studio where guests could have a go at many of the arts founded in Staffordshire. A change of name in 1992 to the Safeway Farm didn't see a huge change to the line-up though Farm-a-Rama didn't survive and the Milking Shed became a barn to view some of the animals up-close. In 1995 the area had a major change when the farm was transformed into the more fantastical Old MacDonald's Farmyard with the addition of the Doodle Doo Derby and Tractor Ride, constructed on the front paddocks and the Singing Barn taking over the Pottery Studios. By the end of the 2013 season fences had once more sprung up around the Farmyard, with plans being made for a rethemed area the following season. 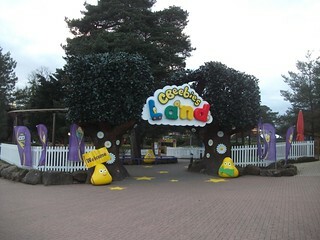 CBeebies Land was officially announced on 15th October 2013, and promised to bring several popular brands and characters to the new area. 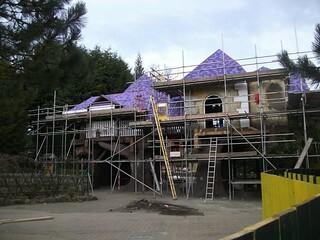 No new rides were added in the first season of CBeebies Land, with the focus instead falling on retheming the existing rides and adding shows and walk-through attractions. In subsequent seasons the area expanded quickly, with the addition of the Octonauts arriving in 2015 and the Go Jetters arriving in 2017, alongside the Furchester Hotel. 2019 saw the arrival of Peter Rabbit Hippity Hop but also saw the departure of Nina's Sceinece Lab.